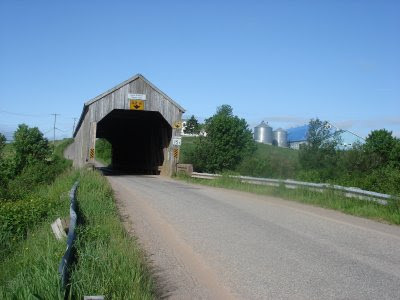 Well this is the week for the Kings County Covered Bridge Festival so I feel compelled to write a blog about covered bridges. 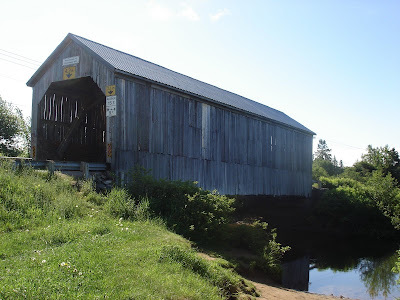 In fact I think it about time that I wrote a blog about covered bridges. For me a covered bridge is a starting point, a swimming hole, a meeting location, a prominent landmark, and a vital part of our heritage. As someone who enjoys being on the rivers I often see numerous covered bridges. Many canoe trips have started or ended at a covered bridge. This is likely because the bridges, for many decades now, have served as an access point to the rivers. 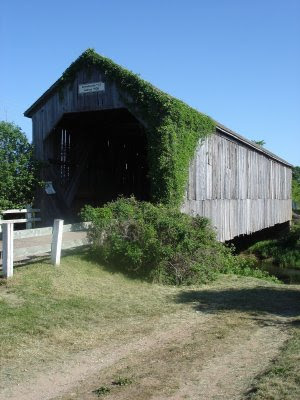 The covered bridges bring together two of the oldest modes of transportation, canoe and horse carriage which speaks volumes about the history of many of the covered bridges today and their importance in the development of the communities around them. I have swam, many times, from the shores of a covered bridge and admired the wood work from the water side while swimming. Geocaches are often found at covered bridge locations as they find them intriguing and fellow cachers like tagging covered bridge finds. Photographers and painters are seen frequently with equipment trying to capture the true essence of the covered bridge. The bridges could be considered a free museum, located where they always have been, across the rivers and in our hearts.